Santa Clara, CA – March 17, 2010 – Aqua Hotels and Resorts, in collaboration with Milestone Internet Marketing, proudly announced today the launch of the newly revamped Aqua Hotels and Resorts portal website (http://www.aquaresorts.com). The website serves as a portal site for all of Aqua’s properties where Hawaii travelers can shop and choose desired accommodation at one single internet address. The portal boasts a fresh, new, consumer-friendly look and highlights enhanced Web 2.0 features including social media connections and an interactive destination blog (http://blog.aquaresorts.com). Aqua Hotels and Resorts feature a wide range of hotels, from economy to boutique style accommodations. The website targets sophisticated Hawaii travelers and budget-minded vacationers alike. Milestone collaborated with Aqua in conceptualizing the new and improved portal website keeping in mind usability and the targeted market. Milestone and Aqua had many goals in revamping the portal website including improved site navigation, enhanced design and architecture, and maximized search engine optimization to improve the website’s performance measured by increase in search engine visibility, website and blog traffic, and overall online bookings. “Milestone was instrumental in determining the design and site architecture. With their expertise in SEO, usability and design, we trusted their recommendations. The website revamp has met Aqua’s goals. Our hotels are presented by island, which has improved the visibility for both Waikiki and neighbor island properties. Best of all, our conversion rate has doubled and we exceeded our website revenue goals within the first 30 days the site was live.” Stated Amber Watt, Director of Internet Strategy, Aqua Hotels and Resorts. Aqua managed properties benefit from the company’s initiatives as the managing company stays on top of the latest and greatest in internet technology and marketing strategies. Milestone Internet Marketing, Inc. is a leading provider of internet marketing solutions for the lodging industry. Milestone’s portfolio of services includes Hotel Website Design, Search Engine Optimization, Pay-per-Click marketing, Social Media Optimization, eBuzz Connect™ Online Reputation Monitoring, etc. Milestone currently works with over 800 hotels and drives over $250M in annual revenue for its clients. Milestone is a preferred vendor for several major lodging industry brands and works with some of the leading management companies. Milestone is also well known as a lodging industry educator for its Hotels to HTMLs internet marketing workshops and book. For more information, please visit www.milestoneinternet.com or call (888) 350-8396. 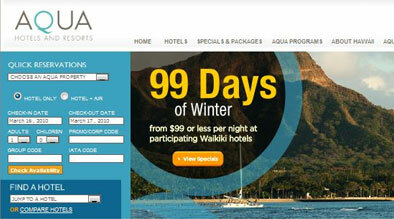 Aqua Hotels & Resorts is a management company founded in 2001 by Hawaii hotelier Mike Paulin. The company provides independent hoteliers and individual owners with full-service administration including revenue management, Internet distribution, sales, reservations, as well as individualized and brand advertising and marketing for maximum profitability. The company is headquartered in Waikiki and represents 17 contemporary hotels and resorts located on Oahu, Maui, Kauai and Molokai. For more information on the company and individual hotels, visit www.aquaresorts.com or call 1-808-943-9291. For reservations, see your preferred travel agent, book online or call Aqua toll free from the U.S. and Canada at 1-866-406-2782. From Hawaii, call 808-924-6543. Aqua is represented in Australia and New Zealand by Travel Reflections, South Korea by Pacific Air Agency Group, China by Aloha Consultant Company, Japan by ARM International and United Kingdom by First Public Relations.